Malta and the sister islands, Gozo and Comino, although small (just 316 sq km), enjoy a huge cultural heritage and its varied history has given it a huge number of historical places of interest, from the beautifully city of Mdina also known as the silent city to the world’s oldest surviving freestanding structures located on Gozo. Its influences vary from North Africa to Southern Italy which has inspired mostly the local cuisine, somethine locals are vey proud of. Malta ia a very family friendly and safe destination and offers plenty to keep visitors entertained, along with a large number of beaches, the most famous of which are those in the northern part of the main land and on both Gozo and Comino. 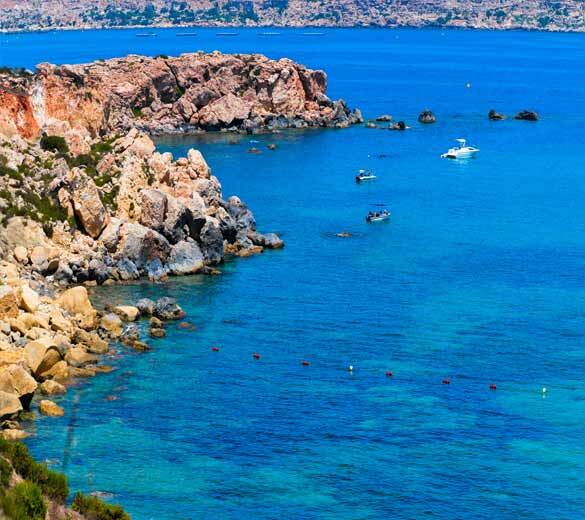 ​Malta’s climate is typical of the Mediterranean and is strongly influenced by the sea. The Maltese Islands have a pleasantly sunny climate with a daily average of around 12 hours of sunshine in summer going down to 6 hours in mid-winter. ​Malta is a dream destination to get married in. Wonderful Mediterranean weather, laid-back villages, inspiring churches, gorgeous beaches and some unique wedding venues, ranging from romantic secluded beaches, grand gardens in private venues, magnificent villas, fairy-tale palazzos and castles, luxury hotels, modern sea view locations… to name just a few. these wedding venues make Malta the perfect backdrop for a couple’s “Big Day”. Whether it is a civil marriage, a marriage blessing, a wedding celebration or a more religious wedding, couples that get married in Malta are really spoilt for choice. Through these pages we hope to inspire you with some lovely images and testimonials of past weddings held in Malta and Gozo. Making Malta your dream wedding destination too! ​With the wedding over, you then have time to explore the Islands. You’ll never exhaust the possibilities which range from the cosmopolitan side of Malta to the lure of Calypso’s Isle, Gozo , and the solitude of Comino.